Swim in the calm waters of Playa de Las Teresitas is a real pleasure. Swimming fans find there the perfect place to practice their favourite sport. Thanks to its breakwater, the beach is sheltered from strong currents. The tranquility of its waters, with a temperature average that ranges between 18° in winter and 22º the rest of the year, make it a superb natural swimming pool where you can enjoy the benefits that provides swimming and sea water. Swim only when the green flag waves. The red flag indicates high risk, and the yellow the existence of hazards, such as discharges, currents or jellyfish. Before swimming warm up your arms, waist and feet muscles. At the end stretching is also important. Use sunscreen because in water solar radiation has greater incidence. Is easier swimming parallel to the coast, this way you avoid waves which may hinder your stability. Combine breaths to avoid injury from repeating the same movements. 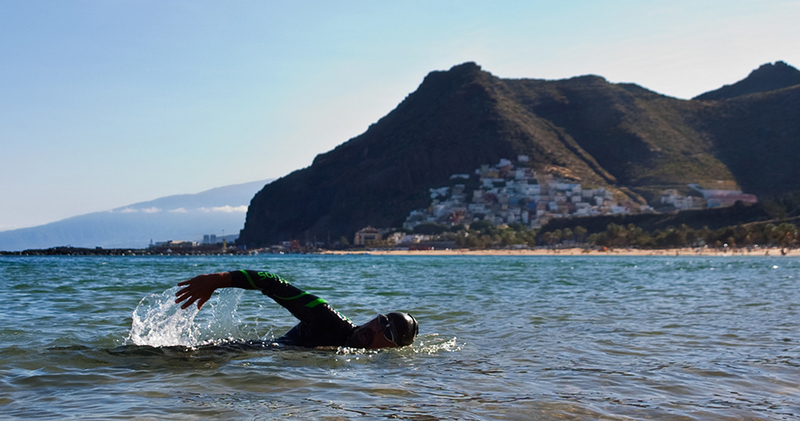 If you train only, it is important that there's always someone who knows you're in the water.